What's in the GM pipeline? How will it work? Who will control it? 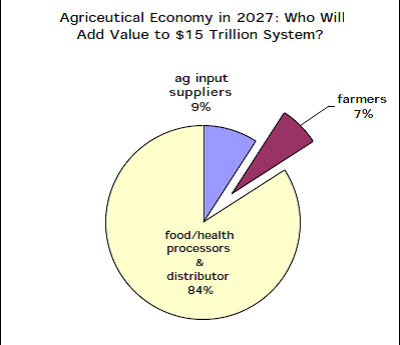 What does it mean for farmers, consumers and policymakers? Biotech's 3rd Generation refers to products that will offer perceived health, nutrition or lifestyle benefits for consumers. The lure of a technologically-integrated $15 trillion system will attract whole new corporate configurations. The Gene Giants may slip down the food chain when the food & beverage industry or the grocery retailers buy into Generation 3.